Beatrice Hoffman will reveal the masterly qualities of her sculpted 'strong-forms' in a series of photographs. Beatrice Hoffman is an accomplished sculptor and sculpture teacher. The artist works mainly with clay: though also in stone, wood, plaster and polystyrene/expandable foam. She aims to achieve a degree of both simplicity and abstraction. 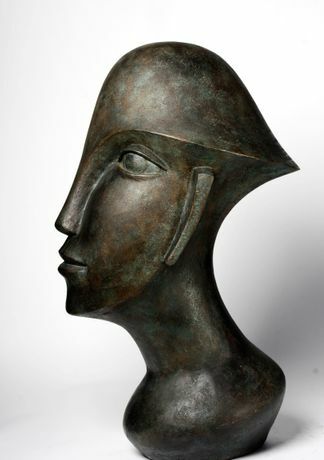 In both figurative and abstract sculptures, the artist searches for a sense of fullness, contrasted with negative shapes; sharp angles between surfaces which are juxtaposed with smoothness. In 2017, the artist won a large commission for Northampton Hospital. The life size work-in-progress will welcome the public at the entrance of the hospital, and raise awareness towards organ donation. Beatrice Hoffman is fascinated by strong form. With her abstracted heads particularly, she explores themes on the interface of mythology, philosophy, psychology and spirituality. As a former Arts Therapist, she is very aware of her themes, and the psychological and expressive potential of sculpture as a medium. The exhibition promises to reveal the masterly qualities of her sculpted strong forms in a series of photographs in the Restaurant Gallery of The Jam Factory, Oxford.